Eat Halal: Fuze Drinks Halal / Haram? Fuze Drinks Halal / Haram? Fuze Banana Strawberry, Banana Vanilla, Fuze Blackberry, Fuze Blackberry Blueberry Grape, Fuze Blackberry Raspberry, Fuze Cranberry Raspberry, Fuze Dragon fruit, Fuze Fruit Punch, Fuze Mango Orange, Fuze Melon Strawberry, Fuze Peach Mango, Fuze Strawberry, Fuze Tangerine and Fuze Tropical Fruit Punch. 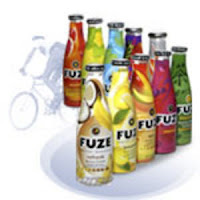 I have called the number listed on the product label for Fuze drinks (1-800-208-2653). The customer service rep checked and informed me that the only animal based product used in these drinks (some of them) is milk. The drink I was asking in particular about was "Fuze refresh Banana Colada". The rep on further inquiry informed that the rest (other then banana colada) of the drinks dont contain any other animal products either and that there is no alcohol being used. If anyone else has any other information to add to this (or any other post) don't hesitate to comment on this post.